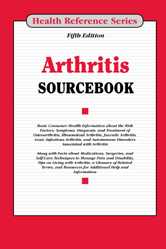 Arthritis Sourcebook, Fifth Edition provides updated information about diagnosing, treating, and managing degenerative, inflammatory, and other specific forms of arthritis. It also explains the symptoms and treatments of related diseases that affect the joints, tendons, ligaments, bones, and muscles. Details about currently used medical, surgical, and self-care management strategies are included along with tips for reducing joint pain and inflammation and managing arthritis-related disability. Section 1.1—What Are Bones, Muscles, and Joints? Section 8.2—What Is Childhood Arthritis? Section 19.1—What Is Paget Disease of Bone? Section 41.1—What Is Complementary and Alternative Medicine?